Four fascinating days were enjoyed by the participants in the EEG’s first residential practical dowsing event. The programme was loosely structured to allow each person to follow and develop their own interests. Most people preferred to work in small groups but some drifted away as they became engrossed in their own research. Everyone gathered at meal-times to exchange findings and join in some stimulating discussions that ranged over a variety of topics from crop circles and healing to chanting and levitation. The first day was spent at Glastonbury. Checks were made for underground water, early buildings and the position of major energy features around the Abbey. Interest focused on the site of Arthur’s grave, a spot near the High Altar and the Abbot’s Kitchen. A vesica piscis was dowsed linked to Arthur’s Grave which encompassed the main Abbey building. A group of dowsers participated in an experiment to identify the energies near the High Altar. The aim was to confirm the number and location of radial energy lines. However, each person found a different number of lines. On questioning this (assisted by some inspired dowsing by one of the group) we were informed that there were several features overlaid at that spot and that our quest was to investigate the precise nature of these various energies. This developed into a study of radial/torroidal energy forms which became a bit of an obsession for the rest of the weekend. The Abbot’s kitchen provides several lessons in sacred geometry. We were fortunate to have someone who had seriously researched this in the group. Knights Templar influences quickly became apparent but once again we found that the energies associated with the building were plentiful and complex. Serious dowsing gave way to quiet relaxation at the end of the afternoon when the group soaked up the peace and tranquillity of the Chalice Well Gardens. Wells Cathedral provided a suitable contrast for the second day. The magnificent cathedral contains many lessons in sacred geometry and has very strong energy in the octagonal Chapter House. We were intrigued to discover why the present cathedral was built in a different position and alignment to the earlier churches on the site. We confirmed that the foundations of the Anglo-Saxon church aligned with the main street of the medieval town and that there were strong energy lines still in place. A number of energy lines were found linking the early churches with key parts of the main cathedral but there appeared to be no obvious reason for the changed alignment. After lunchtime discussions in the cathedral cafe we drove to one of the highest points on the Mendip hills to explore the Priddy Nine Barrows. This is a complex of 17 barrows and 3 circles in a very exposed location. We were interested to know why this inhospitable site was selected by an earlier civilisation. Strong energy lines were found running through the site. These align with the main barrows which are assembled in a shape resembling a hockey stick. We had insufficient time to confirm whether the complex followed an earlier energy pattern or if it was used to alter the direction/nature of the energies. On Sunday we were joined by the Wyvern Dowsers at Stanton Drew. This site was built at a similar time to Stonehenge and Avebury and has not been researched in much detail. It consists of three circles, the remains of an avenue and some outlying stones. A variety of information was recorded which is still being assessed. The polarity of stones was measured and water and energy lines mapped. There was general agreement that the smaller NE circle was a power source for the main circle whilst the SW circle had healing properties. 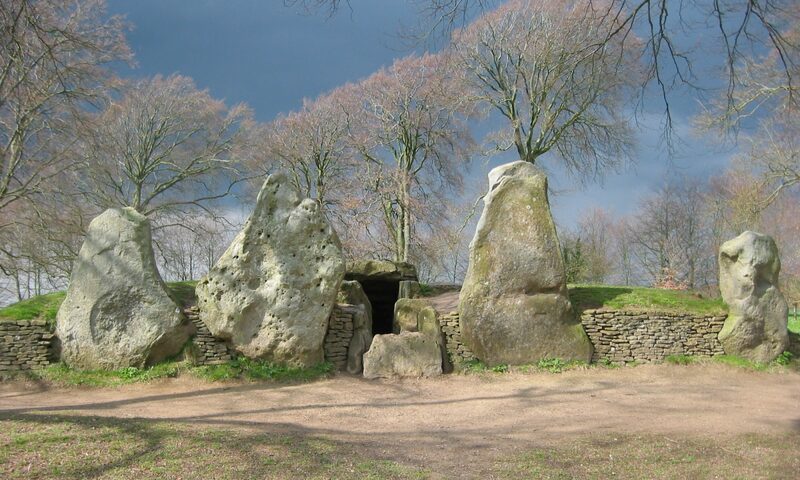 The group of recumbent stones on the edge of the NE circle were dowsed as some sort of cavern or initiation chamber, where preparations were made before entering the main circle. Three people independently identified irregular five sided shapes within the main circle and several people found a series of concentric rings. These rings appeared to reflect the location of earlier ditches but also carried energy. The direction of this energy reversed with each concentric ring. There was also a strong indication that the directions changed as a result of the influence of the sun and/or moon. Some detailed findings recorded in the NE circle are shown in the box. The final day was spent tracking the Michael and Mary lines through Somerset. We were intrigued to discover the number of churches with carvings and stained glass depicting St Michael/St George with dragons. Our earlier findings in Glastonbury were reinforced when we found several lines other than Michael and Mary around these sacred sites. However, both Michael and Mary appear to be very significant. After driving around the Somerset lanes looking for somewhere to eat we eventually found the only country pub that was open. Surprise, surprise it was located on the Mary line. Similarly the only crop circle to appear within an easy drive of Glastonbury was located on the Michael line. This is the first time that the EEG has held a four day event. The number of people attending ranged from 8 to 18 on different days. Some people preferred to take time out to dowse on their own or visit the bookshops. There were no earth shattering revelations. In fact our dowsing seemed to pose more questions than provide answers. It made us aware of the need to be very systematic in dowsing and to record information carefully. It also became apparent that every dowser has their own path or mission. Each one of us seems to tune in to our own level/layer/frequency to find what is relevant to us. Reaching a common set of findings at each location became a rarity. However, it was good fun to be in the company of a group of like-minded people and a great privilege to be party to a stimulating encyclopaedia of knowledge. Roll on the next event. A total of 10 lines radiated from the centre of the circle. They were not all equally spaced. At the end of each radial line was a 3 1/3 turn spiral. The radial lines were of alternative polarity (as on a battery). If one was positive the next was negative. Positive lines ended in a clockwise spiral whilst negative lines ended in an anti-clockwise spiral. Sitting outside of the stones were 3 energy rings. Each ring or “band” contained 12 turns of a Torus between each radial line. These 3 bands consist of 2 anti-clockwise and 1 clockwise drift, with adjacent bands containing toroidal rotations in opposite directions. The rotations around each band contained a number of fibres within itself so that it resembles a rope that has multiple turns within itself.